Equal pay for equal work? We still haven’t arrived at that destination. Decent pay that reflects the dignity of all who labor? In today’s America, we’ve barely even begun that journey. The new GM CEO Mary Barra is making over 300 times what the automaker giant is paying its workers. The long days for GM’s flacks began — on an upbeat note — back in December when the auto maker’s board of directors named Mary Barra, a veteran General Motors executive, the company’s new CEO. That announcement made instant international headlines. A major global auto maker had never before had a woman as chief executive. GM officials would spend the next month lapping up all the congratulations. But earlier this month, the hurrahs for GM’s historic hire turned into hoots of derision. A company filing revealed that Barra would be making $4.4 million in 2014 salary and short-term incentives. A tidy sum to be sure, but only about half the total compensation that Barra’s CEO predecessor was taking home. General Motors, critics charged, was underpaying its first woman chief exec. 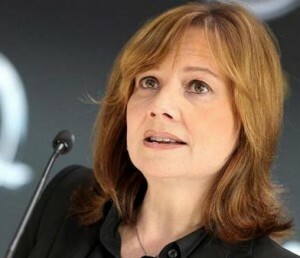 Mary Barra’s CEO compensation, says GM, will be in line with her peer group. The $4.4 million 2014 pay figure for Mary Barra, GM pronounced, didn’t include her long-term incentive. How much would these rewards total? GM wouldn’t say exactly. “Specific long-term incentive compensation numbers,” the company explained, would have to wait until April. This vague initial response would do little to calm the waters. Last week, in still another attempt “to correct misperceptions,” GM relented on the full-disclosure front and released chapter and verse on Barra’s complete 2014 pay package. The auto maker’s new CEO, turns out, stands to take home $14.4 million this year once long-term incentives get factored in, about 60 percent more than her predecessor’s take-home. So CEO Barra will receive $10 million extra if GM “performs”? But what about the men and women at General Motors who do the company’s actual performing, the workers who make GM’s autos and trucks? How much will these workers receive for GM’s 2014 “performance”? How much will workers receive for GM’s 2014 ‘performance’? We won’t know that until next winter. We do know that GM’s 48,500 hourly workers will be receiving, for the company’s 2013 performance, up to $7,500 each in profit-sharing checks. In 2014, chimes in CBS MoneyWatch, GM CEO Mary Barra will be making 329 times what the average auto industry worker takes home. Women make up about 21 percent of auto industry workers. The first-year workers at GM among them will make less in a year than CEO Mary Barra makes in a day. This pay gap between Barra and GM’s rank-and-file doesn’t seem to embarrass Tim Solso and his GM board mates, not anywhere nearly as much as the much tinier gap critics initially saw between the pay of Barra and her male predecessor. GM’s officialdom rushed to correct that “misperception” they were paying their first female CEO any less than her male counterparts. GM’s officialdom rushed to correct that ‘misperception’ they were paying their first female CEO any less than her male counterparts. We should all be pleased, of course, that GM’s directors felt such an intense need to demonstrate their commitment to equal pay for equal executive work. The pressure — and embarrassment — that GM’s top brass felt helps show that years of struggle against sexist pay inequities are bearing fruit. No major American corporation, this Mary Barra episode reveals quite clearly, can afford these days to get publicly branded as an employer that discriminates against women. American society has come a long way. But this Barra episode also shows how far we have yet to go. Most women will never sit in a corporate executive suite. Neither will most men. They’ll work in regular jobs, and in those jobs they’ll generate immense amounts of wealth. The rewards for creating all this wealth? Much more than the lion’s share will go to America’s overwhelmingly male corporate executive class. Maybe someday the enormity of the pay gap between workers and executives will embarrass corporate leaders as much as the hubbub over Mary Barra’s compensation has this month embarrassed General Motors. We can hope for that day. Better yet, we can fight for it.